Try all our foam ear plugs easily, and at a big discount. Our Try 'Em All! Foam Ear Plug Trial Pack contains 1 pair each of 45 different disposable foam ear plugs, priced to save you money. Try them all to find which works best for you. 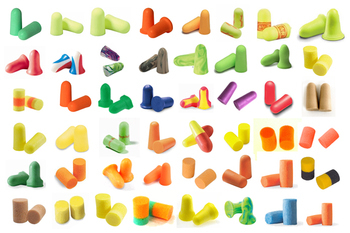 All of these ear plugs are available in packages from single pairs to thousands of pairs here at Ear Plug Superstore. To help you with your search, we have listed the ear plugs first by NRR and then within the NRR from least to highest price. Foam Ear Plug Trial Pack: Try 'Em All! (45 Assorted Pairs)5golfergalMarch 15, 2017I like the variety packs. Such a good deal. We attend many sporting events so I keep a package in each of our cars to always have them at hand. I like the individual paxkaging. Foam Ear Plug Trial Pack: Try 'Em All! (45 Assorted Pairs)3Per Arne HasselSeptember 23, 2016A large number of ear plugs in different colors. But I have not found it quite a big difference exept for the colors. And 95% of all the plugs are big size while my right ear has a narrow ear canal. Foam Ear Plug Trial Pack: Try 'Em All! (45 Assorted Pairs)4WaltJuly 23, 2016There is no better way to find the right earplugs than to try this variety pack. It's so full of different colors and shapes it's like a Halloween bag! The variety is great, from small to large, soft to firm, and many different shapes. There is bound to be at least one pair in here that will work for everyone. My only gripe is that the documentation could be better. The accompanying printed guide is essential, but it's lacking information. For example, the two Hearos plugs come in identical packaging, so I had to guess which was which. That packaging also referred to additional information on the box, referring to the box in which a large quantity of Hearos would be shipped--which of course didn't apply in this case. One pair of plugs was in a plastic bag with no information at all printed on it. Some of the 3M products were pretty skimpy with data too, such as not even giving the NRR rating. I have been dealing with this store for years (and will continue to do so) and staff have been very responsive, so if you have questions, you will get quick answers; still, the accompanying guide sheet in this pack could be usefully enhanced so we don't have to ask questions. Foam Ear Plug Trial Pack: Try 'Em All! (45 Assorted Pairs)5KathyFebruary 27, 2016Still working my way through this big selection of earplugs. Hoping to find the pair that will drown out my loud neighbors. Foam Ear Plug Trial Pack: Try 'Em All! (45 Assorted Pairs)5DavidMay 1, 2015Roll-up plugs I'd found locally never worked well with my ear canal shape. In this sampler pack I've found several pairs I can use (and ones I can't also), and there are many more left to try. I'll be switching from no-roll foam plugs (also found through a sampler pack) to these for the greater noise reduction. Foam Ear Plug Trial Pack: Try 'Em All! (45 Assorted Pairs)5KSmithJune 17, 2013After trying every type of reusable ear plug recommended by the various motorcycle publications I read, I still couldn't find anything that stayed in my right ear. I even spent $25 for six pairs of this putty stuff that was so highly recommended. Pretty disgusting. I have no idea why that ear can't hold an ear plug, but a more scientific approach was definitely needed. I've only tried a few pairs of these foam earplugs so far, but they work much better than anything else. At this price, it's a no brainer. Foam Ear Plug Trial Pack: Try 'Em All! (45 Assorted Pairs)5LoriJune 12, 2013This pack made trying ear plugs out kind of fun. The LaserLites and the MaxLites were my favorite in the bunch. I would recommend this pack to anyone trying to find their own perfect pair. Foam Ear Plug Trial Pack: Try 'Em All! (45 Assorted Pairs)3RussJune 9, 2013This is a really GREAT idea. (The audiology centre I visited, agrees!) I have tried several pairs, but have still not found one that "works" -- probably because I have very small ear canals. I wish they had "extra small" ear plugs. Or better: a way for us users to measure our ears, to know which ones are likely to work. Foam Ear Plug Trial Pack: Try 'Em All! (45 Assorted Pairs)5TimMay 18, 2013It may take me awhile to try them all but what a choice.. Quick, accurate delivery. How nice is that? Foam Ear Plug Trial Pack: Try 'Em All! (45 Assorted Pairs)5JimFebruary 15, 2013I can echo some of the other reviews here; I ride a motorcycle and need to find a set of earplugs that will work for me. The ones I've been using cause extreme discomfort on long riding days so I'm hoping to find something I can use and then order just them from now on. This is a great deal on a variety pack! Foam Ear Plug Trial Pack: Try 'Em All! (45 Assorted Pairs)5mccnDecember 28, 2012This is a great way to find the exact right earplugs for you - a fantastic assortment of many different types, sizes, and noise ratings. I worked my way through all of them, keeping notes on the handy enclosed checklist, and am super happy to find a couple of types that work for me! Great service, and great product! Foam Ear Plug Trial Pack: Try 'Em All! (45 Assorted Pairs)5Gene BammelOctober 13, 2012This is a great deal! the only way you will know which ear plugs work best for you, is to try a variety of designs and materials. I found several that work well for me, and found some that just weren't right for me. This is a great package! Foam Ear Plug Trial Pack: Try 'Em All! (45 Assorted Pairs)5GeorgeJune 30, 2012Inexpensive way to find the perfect earplug for my ears and needs. Thanks. Foam Ear Plug Trial Pack: Try 'Em All! (45 Assorted Pairs)5scootRRJune 8, 2012I've been looking for a pair of earplugs for riding my motorcycle and wanted to get a bunch of them rather than get a small pack of 6 pairs. But I needed to figure out which plugs would be right for me. In my search I found the trial pack and it's perfect. I can figure out which ones are right for me and in doing so, I have a bunch of earplugs for this riding season. Foam Ear Plug Trial Pack: Try 'Em All! (45 Assorted Pairs)5RonnyApril 30, 2012Fast delivery, even over seas. And the ear plugs are much better than the ones we can buy in Norway! And much cheaper! Foam Ear Plug Trial Pack: Try 'Em All! (45 Assorted Pairs)5Mom of college kidsOctober 20, 2011Sent a package to both kids in college. Great idea! Foam Ear Plug Trial Pack: Try 'Em All! (45 Assorted Pairs)5eddieAugust 23, 2011i ride a motorcycle and earplugs are essential. i was having serious problems fitting my generic earplugs from the pharmacy. i simply could not get them to go in properly as they expanded way too fast. i'm only about 40% through the sample pack and already i'm amazed at how much variety there is but more importantly how much better these all are. i've found many that fit very well and several that are fit my specific ear shape well. it's made my riding experience much better already. Foam Ear Plug Trial Pack: Try 'Em All! (45 Assorted Pairs)5NancyJuly 15, 2011Still working on all of these! My ears are pretty small and have an odd curve to get to the canal, so it's been really great to work through a bunch of pairs to see which work well and which don't. I'd really like to see ALL of the pairs they have in here, but this only has the foam ones. I'd like to try to stemmed, plastic, etc. Overall, can't complain! great idea! Foam Ear Plug Trial Pack: Try 'Em All! (45 Assorted Pairs)5KellyJune 5, 2011I like being able to test each variety at a reasonable price before I commit to a large order of one specific type. I'm glad I went with the trial pack, because the ones I thought would be the best were too large for my ears. I'm still working through them all! I am very pleased with the shipping speed and am so impressed that I made another order for the reusable and no-roll trial packs, too! My only one complaint is that one of my samples contained only one earplug. Foam Ear Plug Trial Pack: Try 'Em All! (45 Assorted Pairs)4JayApril 27, 2011Sample pack was great, just none of them worked better then the Flents I already used. Foam Ear Plug Trial Pack: Try 'Em All! (45 Assorted Pairs)5GeorgeDecember 16, 2010Nice assortment, great colors. Only negative was that one package came completely empty.